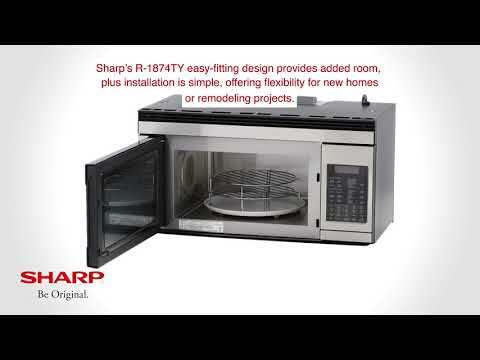 The R-1874 microwave model features 1.1 cu. ft. of cooking space with a stylish stainless steel finish. 8 Sensor Programs to cook, Reheat, and Popcorn & 12 Convection programs to Broil, Bake & Roast. The built-in exhaust system offers three convenient venting options - horizontal, vertical or ductless recirculation - to provide convenience for range-top cooking. 7-Digit, 2-Color Interactive Display that spells out programming steps on an easy-to-read display. Smart & Easy Sensor® Settings that automatically determines cooking/reheating times and selects proper power levels. Easy-fitting design provides added room and installation is simple, offering flexibility for new homes or remodelling projects. Cavity Dimensions : 13.8" x 8.2" x 17.2"
Product Dimensions : 15.4" x 16.3" x 29.9"
Shipping Dimensions - 33.2" x 18.5" x 19.1"